Click this button to sign up for updates about the upcoming Sierra Water Workgroup Summit and other SWWG news. Felicia Marcus, Chair of the State Water Resources Control Board. Discussion of Bay-Delta efforts and Sierra engagement. First showing of the DAC documentary, a brief presentation about Inyo-Mono’s DAC grant and some of its outcomes, and a discussion with the audience about the future of DAC/tribal engagement in IRWM planning. Changing economics under drought conditions and implications for Sierra water management. Impacts on agriculture, water agencies, and tourism. There were no PowerPoint presentations in this workshop. Working with tribes requires a different form of outreach, but can provide some exceptional benefits to IRWM and other planning processes throughout the Sierra. Perspectives on land responsibility and sovereignty, legal status of tribes in California and agency responsibilities, what this means to Indians on an individual and family basis; and local-level collaboration. Each IRWM Region in the Sierra gave an update. Contact information provided at the end of each presentation (all presentations combined into a single file at right). Protecting Water Rights … Or … What Could Be Simpler Than The American River? Roundtable Discussion with Practitioners. How water rights are managed in California, how water rights and regulations change in times of drought. Specific cases will be explored. 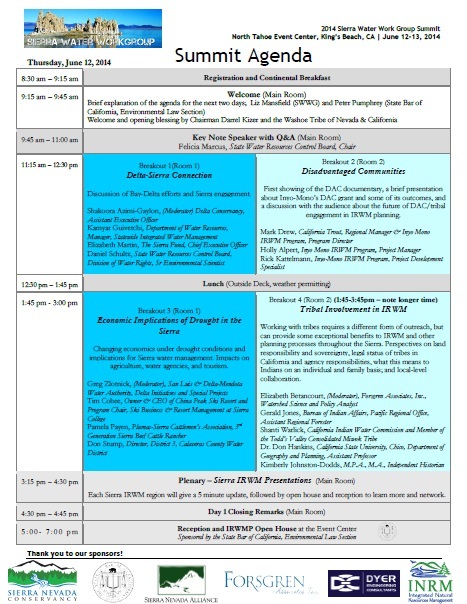 15 Minute presentations followed by 15 minutes of Q&A, in order of speakers: Overview of fire knowledge with regard to water quantity and quality in the Sierra Nevada. Forestry Regulation and Fire. Mokelumne River Project: Fire and possible effects on water resources. Hillslope Sedimentation and Water Quality in Relation to the Rim Fire, Yosemite National Park, California. Dr. Carolyn Hunsaker, Research Ecologist, USDA Forest Service, Pacific Southwest Research Station. Sharon Duggan, Attorney at Law, Environmental Protection Information Center. Nic Enstice, Senior Regional Policy & Program Analyst, Sierra Nevada Conservancy. Tim Kuhn, Hydrologist, Yosemite National Park. Update on the Grant Solicitation Process. The goal is to help Sierra IRWMPs be more successful in Implementation Grant Applications. Matthew Zidar, Principal Consultant, GEI, Inc.
SWWG Priority Project. Big Picture, assessment project, not engineering. The goals are (1) assess storage loss in Sierra due to sedimentation; and (2) assess potential management changes that could be made under different climate change scenarios. Elizabeth Betancourt, Forsgren Associates, Inc.
An update on the Water Bond including potential legislation and implications for the Sierra.